Betsafe was launched in January 2006 and since then has established itself as a trusted and reliable gaming provider, as well as becoming one of Europe’s leading online poker providers over time. Betsafe has over 450,000 registered accounts from more than 100 different countries, which makes for a pretty good player pool at any given time of day. Since the launch of its original poker room which runs on the Ongame network, Betsafe has also added another one, which is a skin of the Microgaming network. These poker rooms are named Poker Red (Ongame) and Poker Black (Microgaming). Since Poker Red is the original room and has higher traffic than Poker Black, this review will be mostly focused on Poker Red. 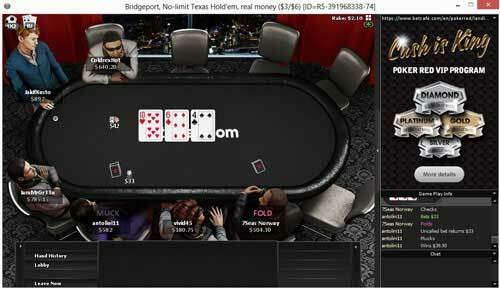 Apart from Hold’em, Betsafe provides Omaha, 5-Card Draw and 7-Card Stud games. All non-Hold’em games are available in Pot Limit and Fixed Limit, as well as in regular and Hi/Lo formats. Despite the variety of games, most ring game traffic is concentrated at low and mid-stakes No Limit Hold’em. Most of the Sit & Go and tournament traffic is also Hold’em and concentrated primarily on low to medium buy-in games, though tournaments are available up to $525 and sometimes run during peak hours. Deposits and Withdrawals are a quick and painless process at Betsafe. A variety of options are available for deposits, including VISA, MasterCard, Skrill and Neteller. Deposits are processed instantly with only a 2.5% fee on VISA and MasterCard deposits, while all other methods are fee-free. Withdrawals usually take no more than 24 hours. As mentioned before, this review focuses on Poker Red – the Ongame client of Betsafe, so the software review part will also be focused on Poker Red. Overall, Betsafe software is quite good and comes in both a downloadable client version and an in-browser version. The downloadable client has OSx support and the in-browser version even allows you to play on a Linux operating system. While Betsafe’s software has nowhere near as much setting and options as some of the major poker room software’s, the client is still pretty well put together and the small amount of setting may actually work to some users advantage, since the software becomes very easy to use. Most of the available setting are in-game settings, which allow you to setup table features like a 4-color deck, the option to wait for the big blind when sitting down at a table, showing animations, etc. Proffered seating and auto buy-in options are also available. The lobby has an intuitive layout, with all the game types available at the top of the lobby. Once you choose Cash Games or Tournaments, just below you can quickly filter game types, limits, stakes and table size. Unfortunately, no additional filters are available, though the standard ones are generally enough. Poker Red tables have a bit of a different layout than most other poker rooms. The chat box and instant game play info are separated from each other, which is a good addition that allows you to easily chat with other players without having their messages overrun by game play info messages. You can quickly access instant hand history and lobby from the bottom left corner. Casino games are accessible from the top left corner and you quickly add new tables from the top right corner of the table. All other relevant information, like pot size, rake, bet amounts, etc. is clearly displayed and the tables are generally lag and glitch free. Just like all other poker rooms, most of the action is concentrated in Hold’em games. However, Betsafe also offers Omaha games (Pot Limit Omaha, Fixed Limit Omaha, PLO8, Fixed Limit O8), 7-Card Stud (7-Card Stud Hi/Lo) and 5-Card Draw (Pot Limit and Limit 5-Card Draw), though it can be tough to find games running in those variants. No Limit Hold’em Cash Games are available starting at $0.01/$0.02 up to $5/$10, while Limit Hold’em games run starting at $0.05/$0.10 and up to $500/$1,000. PLO and PLO8 tables have the same small and big blind, starting at $0.04/$0.04 and run up to $10/$10. The same system applies to Pot Limit 5-Card Draw games, which start at $0.10/$0.10 and run up to $5/$5. Fixed Limit games have standard blinds, with Fixed Limit Omaha and FLO8 games starting at $0.05/$0.10 and running up to $25/$50. Fixed Limit 5-Card Draw tables start at $0.05/$0.10 and run up to $20/$40. 7-Card Stud and 7-Card Stud Hi/Lo games start at $0.10/$0.20 and run up to $50/$100. Sit & Go’s are available in all the same game formats: Hold’em Sit & Go’s run starting at $0.30 and up to $525. Omaha Sit & Go’s start at $0.53 and max out at $215. 5-Card Draw Sit & Go’s start at $0.53 and run up to $108. 7-Card Stud Sit & Go’s start at $0.53 and max out at $54. Tournaments start at $0.53 and run as high as $525. Cash games are about the same level of toughness as any other similar size poker room, which is pretty tough at midstakes and higher and decent at low and micro stakes. Tournaments and Sit & Go’s don’t run on a consistent basis, so not many regular players join them. This makes the games very soft. Betsafe’s Poker Red offers players a very competitive Welcome Bonus of up to $2,500. In fact, there are a total of 5 bonus levels available and you can choose any one of them without having to make any minimum deposits! 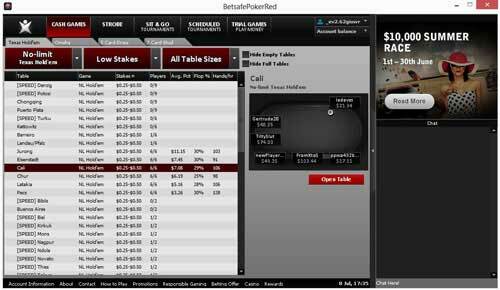 All you need to do is register an account with Betsafe.com, then download and install the Poker Red client. Once you are logged into the client, go to the “Available Bonuses” tab in the top right corner of Betsafe.com. There you can activate your welcome bonus by entering the Betsafe Poker bonus code of your choice. The Bonus code RED1000 will get you a $1,000 Bonus. You will need to earn 8,000 Player Points to clear the entire bonus, which has an expiration date of 70 days. The Bonus code “RED25” will get you a $25 Bonus. You will need to earn 200 Player Points to clear the entire bonus, which has an expiration date of 90 days. The Bonus code “RED75” will get you a $75 Bonus. You will need to earn 600 Player Points to clear the entire bonus, which has an expiration date of 90 days. The Bonus code “RED250” will get you a $250 Bonus. You will need to earn 2,000 Player Points to clear the entire bonus, which has an expiration date of 90 days. The Bonus code “RED2500” will get you a $,2500 Bonus. You will need to earn 25,000 Player Points to clear the entire bonus, which has an expiration date of 43 days. Once your bonus is activated, you can check your bonus progress by going to “My Poker Account” – “Bonuses” – “Activated Bonuses”. In addition to these welcome bonus codes, you can use the code RED11 to get a free $11 tournament ticket. For live chat support, just go to the official Betsafe website and click on LiveChat.